Ferrets are unique pets. While they may look a little like a rodent, they're actually close relatives of weasels and otters. Their Latin name, Mustela putorius furo, means "spear-shaped stinky little thief!" Ferrets weigh about two to five pounds and live up to 10 years. They are bright, sociable little animals with a lot of energy. As a result, they do best when living with other ferrets or when their human friends are available and ready to play on a regular basis. Ferrets sleep about 18 hours a day, but when they're awake they are eager to run, jump, and learn. In fact, they are bright and social enough to learn tricks, very much like a dog. Unlike most other pets, ferrets do have a smell. Some people call it musty; others call it nasty. If you're thinking about adopting a ferret or two, be sure to spend time with one before making a final decision. If you're okay with the smell, you'll almost certainly enjoy your new pet. Ferrets are closely related to animals with not-so-positive reputations, such as weasels and stoats. On the other hand, they're also cousins to adorable critters such as otters and beavers. They're long and skinny, and their coats may be any color from white to black. With all that said, there are lots of ways to come up with great names for your new pet. Here are just a few. With all their terrific qualities, there is no doubt that ferrets have a unique odor. Call it a fragrance, a smell, or a stench, it can be fun to choose a name to acknowledge, appreciate, or honor it! Like cats, ferrets come in a wide range of colors and may have many different markings. There are eight ferret color; they include albino (white with a pink nose and eyes), black (black with a white undercoat and black eyes), black sable (blackish brown with a cream undercoat), champagne (tan with a cream undercoat and burgundy eyes), chocolate (warm brown with white undercoat), cinnamon (reddish brown with golden undercoat), dark-eyed white (white with dark eyes) and sable (deep brown with gold undercoat). In addition to these colors, many ferrets' noses are pink, and many ferrets have a unique combination of colors and markings including speckles, patches, and spots. Here is just a sampling of names that might go with your friend's colors. 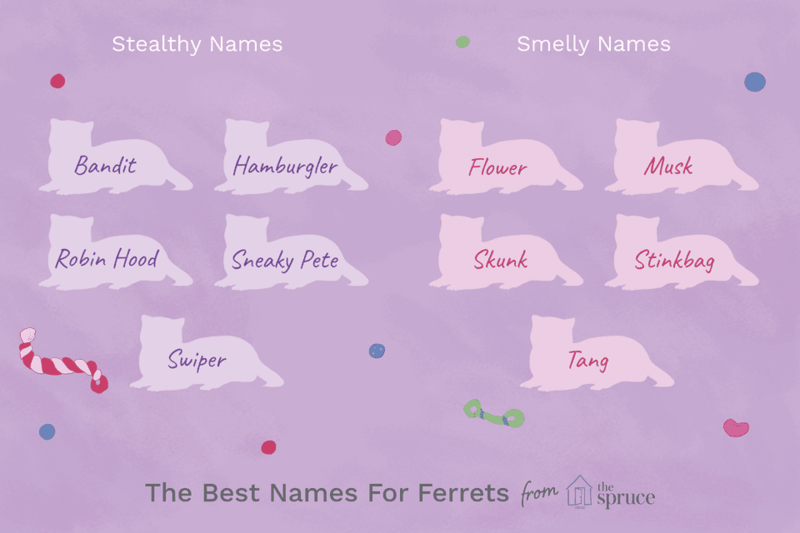 Whatever name you choose for your ferret, be sure you're ready to provide your new friend (or friends) with a clean, comfortable home, plenty of room to move, and opportunities to interact with you and other humans. Remember that ferrets are smart, social, and easy to train; they're also (despite their odor) as clean as a cat.